Diamond Details: 34 Round brilliant cut white diamonds of G color, SI1 clarity, and of excellent cut and brilliance, weighing .43 carat total with 1 pear cut and 17 round cut yellow diamonds, weighing 1.20 carats total. Pendant Details: 18k white and yellow gold design. Pendant Measurements: 29mm in length and 13mm at the widest point. 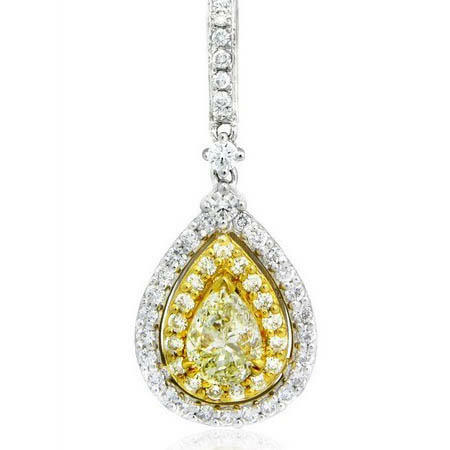 This elegant 18k white and yellow gold cluster pendant, features 1 pear cut fancy light yellow diamond, weighing 1.00 carat, 17 fancy yellow diamonds, weighing .20 carat and 34 round brilliant cut white diamonds of G color, SI1 clarity and excellent cut and brilliance weighing .43 carat total. You`ll love this pendant! The pendant measures 29mm in length and 13mm at the widest point. We also have a variety of chains to go with this pendant, please inquire prior to buying.